ABSTRACT—The purpose of this discussion is to present the general characteristics of Tibetan thangka paintings and the forms of damage to which they are susceptible. THANGKAS PRESENT conservators with unique problems because of their traditional methods of construction and usage. A thangka is a Tibetan religious object in the form of a scroll, which is generally used as a teaching device or as an aid to various religious practices. Thangkas depict Buddhist deities and/or mandalas. A thangka is a complex construction including a painting, a textile mounting (sometimes with leather corners), pendant ribbons, a textile cover, a cord to hold up the cover, a cord or ribbons from which to hang the thangka from top and bottom dowels, and decorative knobs on the bottom dowels. An iconographically complete and useable thangka consists of a painting and a mounting: a painting without a mounting is incomplete. The word thangka is thought by some to have derived from the Tibetan thang yig1 meaning “annal” or “written record.”2 Thangkas originated in India and evolved, in Tibet, from the nomadic lifestyle of early Buddhist monastics. These monks traveled extensively to outlying areas to spread the teachings of Buddha. Everything they needed and used traveled on the backs of yaks, including tents, furniture, and paintings. Consequently, thangkas were damaged, then as now, by rolling and unrolling. Later, when monasteries were built, thangkas hung over shrines and were often damaged by direct contact with the walls behind them. The burning of butter lamps and incense, traditional in Tibetan Buddhist worship, deposited thick layers of darkening soot and grease on the thangkas. Thangkas also present conservators with a unique challenge in choice of treatment. These objects must be treated from the start as composite materials. Sometimes, a thangka must be dismantled and each medium treated separately before being reassembled. In order to preserve the original religious and aesthetic values, many treatments standard to Western painting conservation cannot be utilized; nor should thangkas be given conservation treatment appropriate for Chinese and Japanese scroll paintings on silk and paper. Finally, care must be taken so that inappropriate exhibition and storage techniques do not stimulate deterioration. For a conservator to be able to offer complete and appropriate conservation treatment to a thangka, it is crucial to have some background in the techniques of their manufacture. The author has been documenting thangka painting techniques for sixteen years: first, by working with Tibetan master thangka painters in exile in Nepal, India and the United States; and second, through the examination and conservation treatment of numerous thangkas. This documentation has been valuable not only as a source of information to the conservator but also as a way of preserving information that might otherwise die with the master painters in exile. THE ART OF THANGKA painting is transmitted from master to student through an apprenticeship system, and a student works with a master for many years to learn style and technique. Thangka painting is strongly regional in character, and both style and technique are determined by the place of origin. The mountings also differ in style according to region and subject matter. Western art historians, beginning with Giuseppe Tucci, have focused on the style of Central Tibet. This style generally presents an effect of heavier paint layers and less subtle blending of colors than the more Eastern styles. Most of the research presented in this paper, however, documents the New Menri (17th century) and Karma Gardri (16th century) styles of Eastern Tibet. Traditionally, Tibetan master painters often did not prepare their own supports: assistants specialized in stretching supports and preparing the ground for thangka paintings. The two most common methods of stretching the support are to lace it to a strainer or to wrap it on dowels which are laced to the strainer. Yak-hide glue was most frequently used to prepare the ground of a painting. Prepared through a long process, the most refined parts of the glue were used for the ground. Because it is water-soluble, yak glue renders the finished painting vulnerable to water damage. The author has seen several thangka picture panels that were removed from their cloth mountings and relined onto paper or cloth supports with the use of water-soluble adhesives. This resulted in water damage from behind: the ground and paint layers sunk into the support, and the numerous paint layers lost their subtlety as they sank into one another. The color of the ground is dependent upon the taste of the artist and the materials used. Lime and chalk are the two most commonly used grounds in thangka paintings. Black, red or gold grounds were used for thangkas done in a specific style in which the ground colors related to the iconography portrayed. Some thangkas of recent manufacture have grounds that have been tinted brown to make the thangkas appear old. In Khams, a province in Eastern Tibet, as many as twelve artists might work together on several paintings at a time, the supports having been prepared by their assistants. The painting then proceeds according to traditional steps. The first step is the thig tse, the measurement and layout of the figures and composition. A thig kü, or thread, is covered with colored chalk and strung onto the strainer at measured intervals. With the end held tightly, it is snapped against the canvas to make lines that establish the proportions of the painting: the figures, their location on the field, the border of the painted area, and the sections of the background. Next, the kya ri, a rough charcoal sketch, is drawn on the ground. Guided by the thig tse marks, the master artist sketches the major outlines of the main figures; the entourage and background are often drawn with a bare minimum of measures. Then the sketch is examined and corrections may be made. Indigo or carbon ink is then used over the charcoal sketch to delineate the areas for painting. Another method commonly used by artists today is to trace woodblock prints, or shing par onto the prepared ground to outline standard iconographies. In the Eastern Tibetan style of painting, a color will be applied at least three times; while in the Central Tibetan style, one thicker coat is applied. The damage to paint layers (resulting from the technique of their application) of Eastern style paintings appears as the loss of one or several of the finely applied paint layers; while the damage to Central style paintings usually appears as deep cracking through the one thick layer. After the flat colors have been laid down, line drawing, or ri mo, is applied to the edges of forms. This is usually done with the two main organic dye colors, indigo and brownish red lac. These colors are used instead of black, which is used to color the hair of the figures: to outline other forms in black is considered cheap and hasty. The ri mo may, however, be done in darker shades of the color being outlined. There are two methods of shading, wet and dry. Dry shading, in its finest form, is done with a very dry, fine-pointed brush. Each stroke or dot applies a very small amount of pigment. It takes a very long time to build up any intensity of color, and gradations are achieved by the spacing of the delicate strokes or dots. Dry shading can be applied directly over a flat color or directly over the ground; it can also be combined with wet shading. Wet shading is done by blurring together two pools of wet pigment with a third brush bearing no color. This can be done with organic dyes as well. The next step is called ser ri, or the application of gold ornamentation. Fine gold lines are painted on representations of brocade robes and cushions, and on flowers, leaves and rocks. (This stage should be distinguished from the application of flat gold areas, which is done as the last of the flat color applications.) Finally, both the flat gold areas and the gold lines are polished with a gem stone, such as onyx. After polishing of the golds, which is called ser ur, the painting is cut off the strainer and sewn onto its silk frame, or mounting. Traditionally a tailor would sew the frame. Fig. 1. Photograph of a thangka painted and mounted in traditional Khams regional style by the master painter Khams-trul Pinpoche. The dark background of the painting relates to the iconography of the subject matter. Mountings are often made of silk imported from China, India, and more recently, Japan. For two reasons: the iconographical requirement of “rainbows” (silk borders sewn around the picture panel), and financial limitations, mountings are pieced together from fabrics of different weaves and weights, which causes strain on the weaker fabrics. Additional strain is caused by the structure of the thangka. 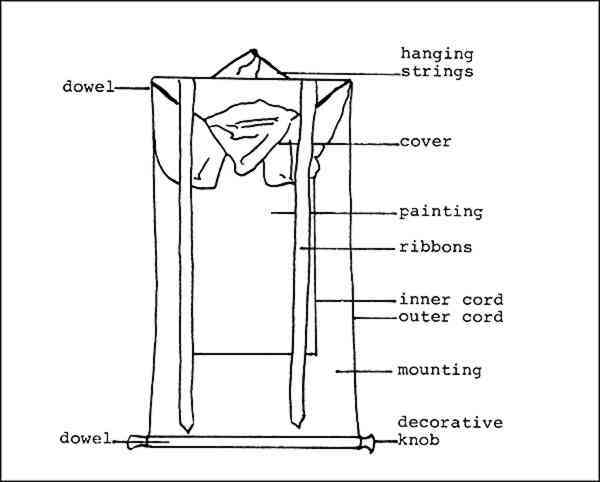 Common points of wear are these: the top corners where the dowels often tear through the mounting; and the top edge of the mounting and cover, both of which are weakened by the weight hanging from them. The “door” panel, an iconographical element, is another weak area. This panel is often cut from a Ch'ing Dynasty court robe, showing a dragon or other design element. Because of their age and previous usage, these panels tend to be weaker than the surrounding silks, and they often contain gold-covered paper threads that require special care. Often all of the silk elements of the mounting are quite dessicated and fragile. Only in recent times have painting panels been sewn into their mountings with sewing machines. Before the use of machines, cotton thread was usually used to stitch through the painting, the cording and the mounting. These stitches were quite tight and held the painting panel firmly in the mounting. As explained above, this tension often caused damage to the support. The mountings are lined with a separate fabric, usually cotton chintz or plainweave silk. The conservator often finds these linings to be quite loose, as gravity stretches the fabric, which is still securely held to the outside edges of the mounting. Often, a tailor has sewn a mounting over an edge or corner of a painting. When the mounting is removed for conservation treatment, it may reveal the protected original painting, with a clean surface, free from incense and butter lamp smoke damage. Finally, there is a consecration (rab ne) ceremony for the finished thangka which includes a cen je, or “Opening of the Eyes,” ceremony. This is a religious ceremony, traditionally done by a monk or a religious teacher, which sometimes involves the writing of an inscription on the back of the thangka. Only after the performance of this ceremony is the living presence of the thangka considered to be embodied in the work and communicated by it. THE MOST COMMON forms of damage to thangka paintings are caused by their reactiveness to changes in relative humidity, water damage, improper handling, and deposits of grease and soot from butter lamps and incense smoke. Thangkas often rested against walls of monasteries, causing a variety of recognizable damage to the supports, ground and paint layers. 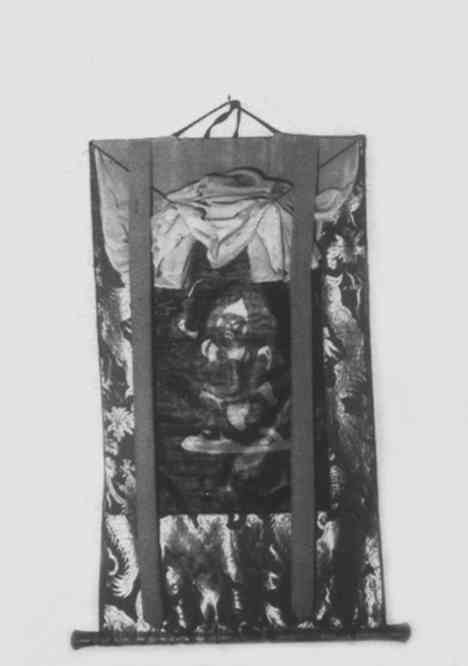 When the back linings became damp, and in thangkas where the back of the support was left exposed, cockling, staining, blurring of details and loss of color clarity were the result. Specifically, changes in relative humidity cause the support to cockle and wrinkle unevenly. The support is firmly sewn into a silk mounting which reacts differently than the cotton support to environmental changes. Large cockles often appear in the center of the support and along the sides, while tight wrinkles are often found in the four corners. Water damage is also caused, as mentioned above, by the use of water soluble adhesives to reline thangka picture panels. When the paintings are removed from their cloth mountings and relined onto paper or cloth supports with the use of water soluble adhesives, the water soluble yak-glue ground and subsequent paint layers sink into the support, and numerous paint layers blur into one another. Fig. 2. Diagram of the same painting shows major structural elements. Due to the style and subject matter, this particular mounting does not have either “rainbows” surrounding the painting, or a “door” in the lower section of the mounting. Improper handling also causes great damage to these objects. The thangka form was devised to facilitate easy transportation; nevertheless, rolling and unrolling a painting over the centuries causes damage to the support, ground and paint layers. The traditional method of rolling a thangka is the only method considered to be respectful: the thangka is rolled from the bottom upwards, rolling the cover into the scroll. This compresses the pigment particles and abrades the surface. The crunchedup cover or, if there is no cover, the back of the mounting and the painting itself can severely abrade the surface. Improper rolling also damages the silk mountings, covers, and ribbons, causing them to crack along fold lines or warp out of shape. If the thangka is rolled by placing the hands on the painting panel instead of on the mounting, or if the thangka is carried with hands around the painting panel, then further damage can easily occur. Also, if the rolled thangka is stored lying flat, the support and ground can fold and crack, resulting in visible damage to the paint layers. This definition of improper handling may seem like a stern condemnation of the habits of the original owners, who were monks and lay worshippers; however, in this case, human-caused damage is not limited to the modern museum person. Damage to the paint layers may also show the effects of the artists' techniques, with interlayer cleavage or deep cracking, the exact nature of the damage often depending on the paint layer structure, as described above. Traditional Tibetan worship includes the burning of butter lamps and incense in front of thangkas. These deposit thick layers of darkening soot, grime and sometimes grease, which are extremely difficult to remove. Butter-lamp and incense smoke are also often imbedded in the silks causing deterioration. AS A RESULT of the above-mentioned damaging processes, the conservator often finds the picture panels and mountings of Tibetan thangkas to be in poor condition. While it is not within the scope of this article to fully describe a conservation treatment of a specific thangka, hopefully such an article will follow in the near future. The author welcomes enquiries on thangka technique and treatment. The spelling of Tibetan words in this paper is phonetic rather than literary. Corrected spelling has been provided by David Jackson. Ibid., and scientific analyses done a samples taken out of Tibet by the Rongae's father and on pigment samples from thangkas. THE AUTHOR WISHES to gratefully acknowledge the help and inspiration of several people, without whom this project could not have been successfully researched or completed. The main informants on Tibetan thangka painting were Vajracarya, the Venerable Chögyam Trungpa, Rinpoche; and Noedrup and Rinzin Rongae, master thangka painters from Eastern Tibet. Many thanks are also due to David and Janice Jackson, authors of Tibetan Thangka Painting, Serindia Publications, London, 1984.